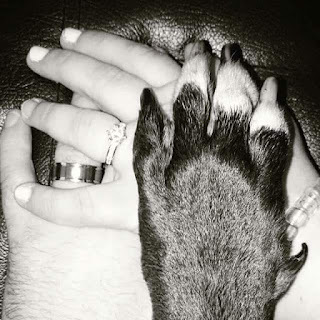 For those who don't follow me on social media, I would like to let you know that I have gotten engaged since I last posted on here. Also hit that follow button for instagram haha, I post almost everyday. Anyway I have been having a lot of wedding fun, looking at dresses, find ''The Dress". Looking at venues, finding the venue, bridesmaids dresses and so on and so on. One of the things I have wanted to do is go to a wedding fair, to look at the few things we still weren't sure of, like photographer, suits and a couple of other things. 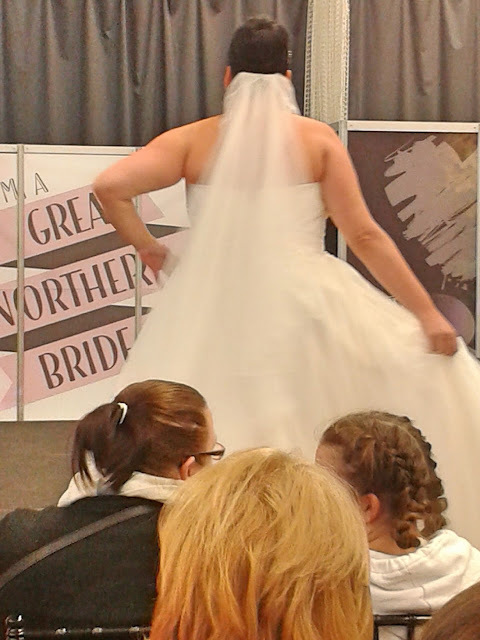 So Paul found the Great Northern Wedding Show at the USN arena in Bolton. I made sure I booked the day off and we went. The event is organised by a company called Little White books (I will link all websites and social media below). A huge positive for this event is if your pre booked it was free entry, even if you just turned up on the day it was only £2 per person to get in, so BARGAIN!!!! 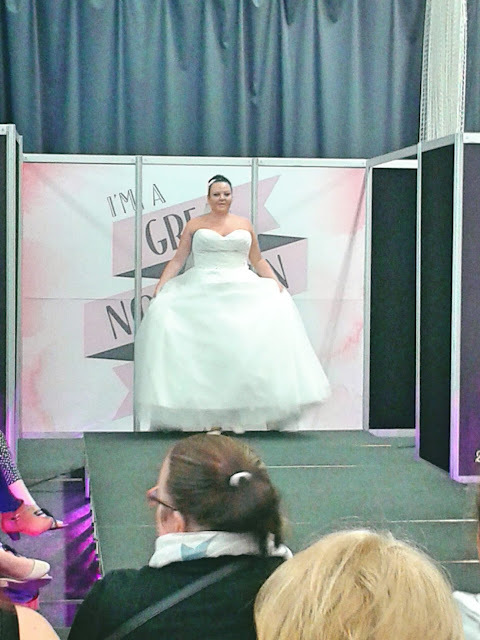 Another big draw for me, because lets face it free stuff is amazing, the first 500 brides to turn up on the day would get a free goodie bag. So as you can imagine I made Paul wake up early to make sure we got there with plenty of time to spare so I could get myself some freebies. 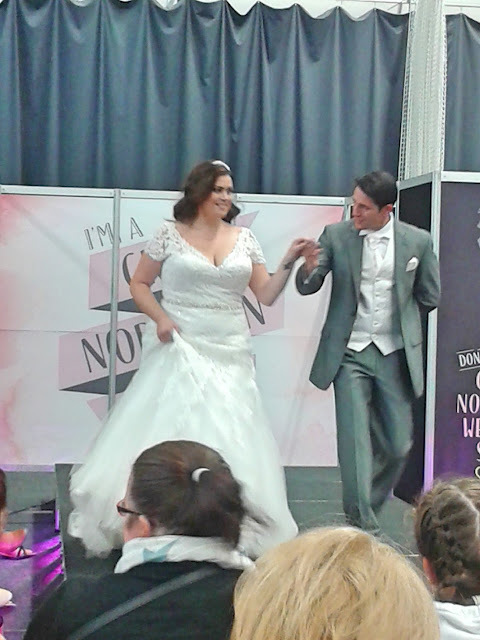 With over 120 stalls with suppliers of suits, wedding dresses, cake bakers, photographers and table dresses (to name but a few) it is the perfect place for any bride and groom to go and get a good deal and some ideas. We got there for about 10.40 and oh ye I got a goodie bag haha! Inside was sweeties (always good) a biscuit, a "Top Five Breakfasts Tips'' for the big day which included a nice peppermint tea bag, a sample of TRESemme Beautiful Full Volume pre wash conditioner and shampoo, a little pack of natural petal confetti, a wedding day SOS kit with a couple ear buds and a cotton pad (which I think is such a good idea, I never even thought about having an SOS kit). Finally it came with a show guide, a copy of Little White Books magazine and M&S cake book. 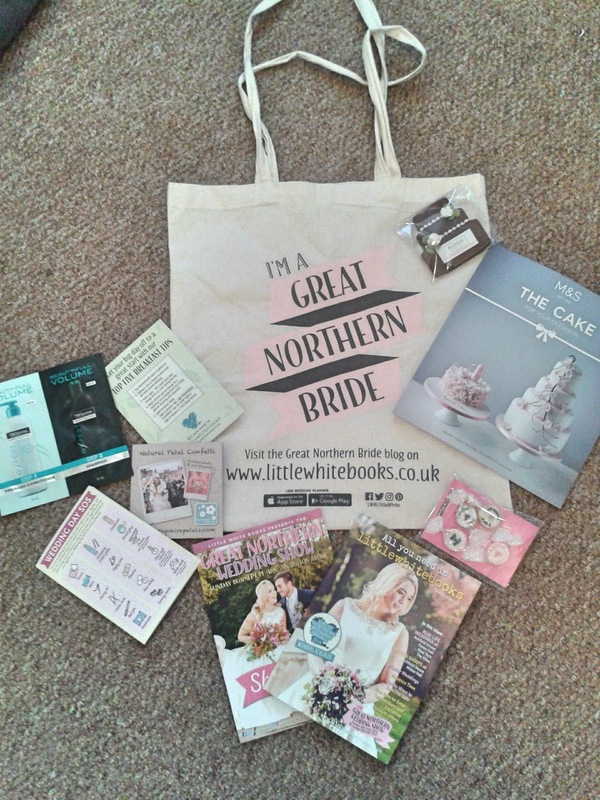 It was all topped off with this lovely ''I'm a Great Northern Bride'' bag, and considering how much stuff we left with it is a lot stronger then it looks. There were another two items in the bag but I have chosen not to include them, there were a protein shake and a meal replacement bar. As a plus size bride who has no intention of loosing weight, I thought this was not really needed. I understand that some women will want to loose weight before their wedding but I am not one of them. So we went inside and wow just wow. As a little side note I would just like to say I have only chosen to cover a small amount of companies there. They are the ones that I looked at the most and so that is why I chose to take pictures and do this post so I can show you what I like. 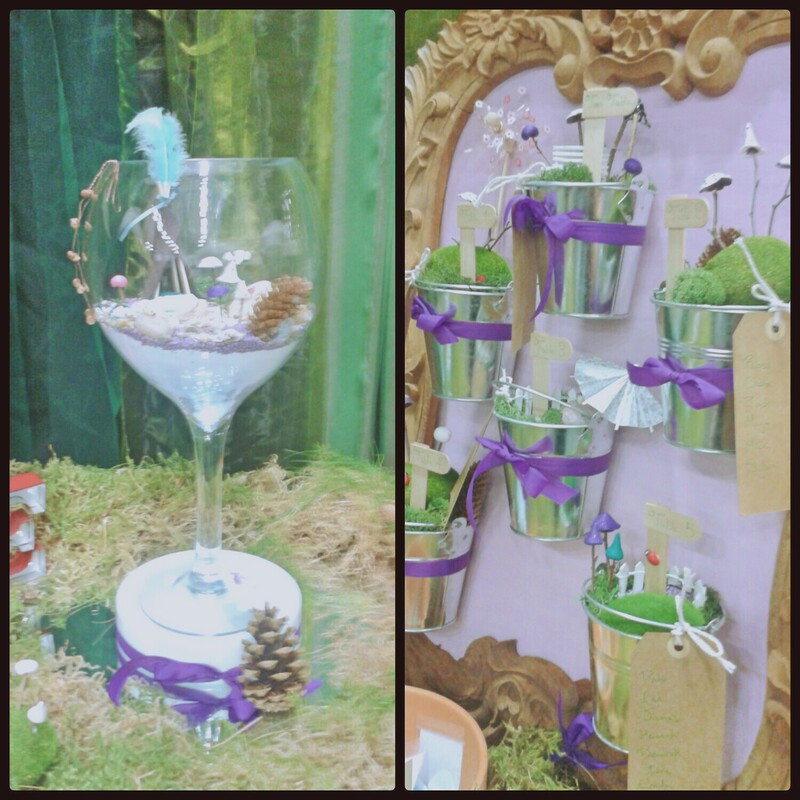 Our first stop was a beautiful stand that makes fairy centre pieces, they are a company called Enchanted Wedding and they are honestly so lovely and so nice. We even asked them about our wedding (since we have our theme) and they said that they can do a custom piece for us if we get in touch with them. Since we are getting married in 2018 she said that she would have plenty of time to think about what we would want. As you can see they make little fairy scenes inside large wine glasses as centre pieces. This one is one of the smaller glasses. 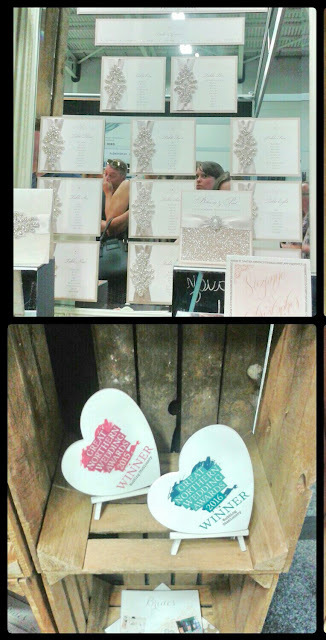 You cant see it properly but there is also little signs inside saying the bride and grooms names. They look so personal and since each one is made for each bride and groom it is such a personal touch for your wedding. The other picture shows the buckets you can have as a table planner, which I think is so original and such a fun thing for your guests to look at to find their table places. Like I said before Sarah the lady that makes them is so lovely and so creative, and I think these are such a creative individual item to have for your wedding. The next stall we went to I got so excited about, it is something I have never thought of but I saw it got excited ran over and asked to take a picture. 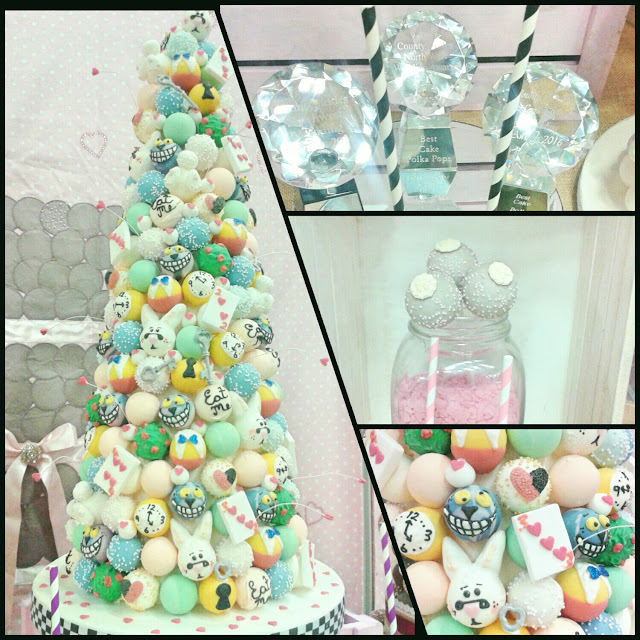 Its a company called Polka Pops which is ran by a lovely lady called Amy and they are CAKE POPS!!!! These are AMAZING and they taste so good too (there were samples and yes I had to try them research purposes only of course haha). 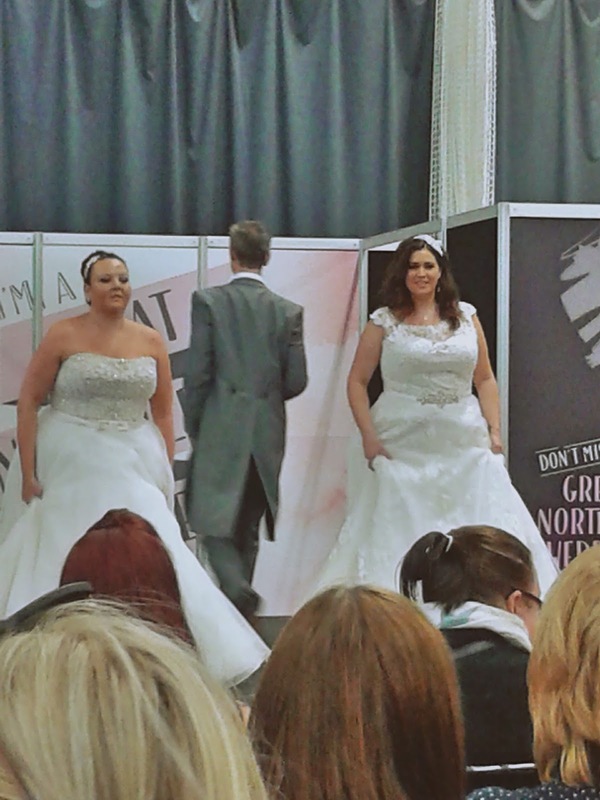 Not only are they brilliant but they are also award winning so well done Amy. I think these are such a cute idea for wedding favours for your guests. There were even head shaped ones so if you wanted to you can even get each guests head made and they could be part of the table seating plan. The biggest cake pop stand there was this Alice in Wonderland one, each cake pop is so individual, you can really see the time and effort Amy puts in to making them. So cute!! 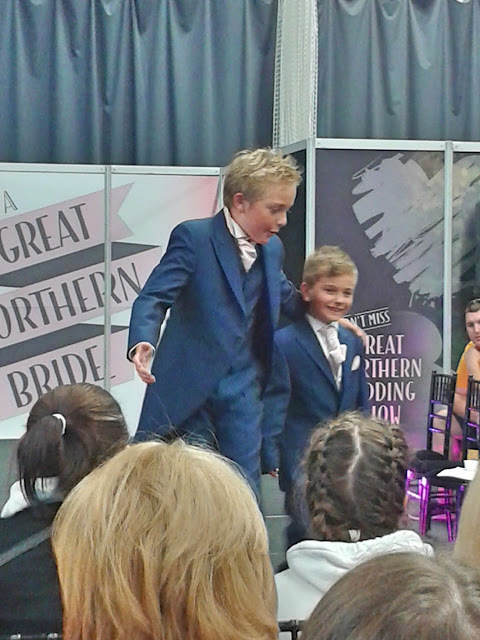 Another company I spoke to is called Brides Little Helper and honestly they really are. I have made my own save the dates and am in the process of writing and getting them sent out, but this company is such a brilliant idea to get it all done in the same place and have the same designs for everything. Brides Little Helper is a stationary and venue dresser, so not only can you get your save the dates and invites from them you can also have these very cool light up signs. On the stall they had the light up Mr and Mrs sign. 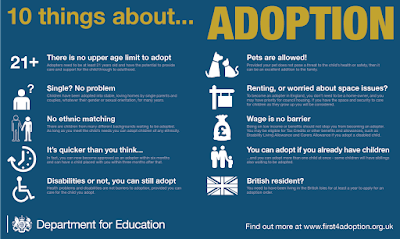 I do like them but they're just not for me, but only because of a really weird reason. I spent time in front of these signs taking pictures and talking to Paul and it get so hot next to them. We are getting married in July and it is hot enough at the time of the year without adding to it. Yes such a weird reason I know. What I was interested in is their stationary. As I said before I already have our save the dates but they were showing things I hadn't even thought of, like a table planner that matched the invites design, its little touches like this that really tie a wedding in all together. So having a company that can do it all for you and put together a package for you is brilliant and something I will be looking into. Also a big well done to them too for winning two awards in the last two years :) well done guys. 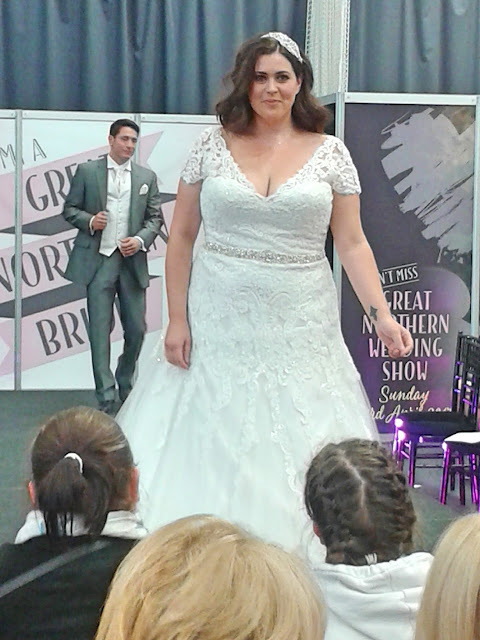 While walking around the event you do get asked if you would like to enter competition, one of them I want to show you is this company, for all of you floral loving brides and grooms out there this is gorgeous. 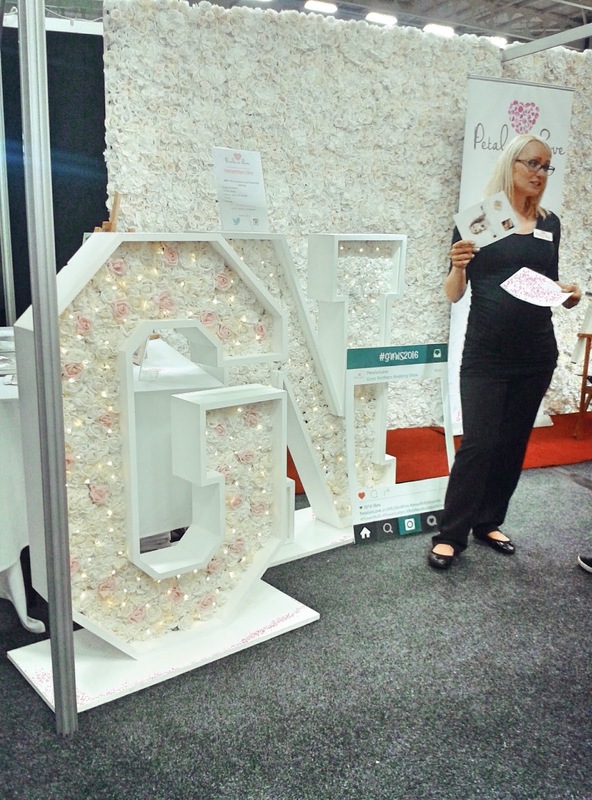 The company is called Petals in Love and they specialise in Bespoke Flower letters and walls, as you can see from my picture. They are just gorgeous, the lights inside and the pinks and whites are so pretty. Not only will it be so nice in the day time but you will also have those lights for the night time too. How sweet would it be taking selfies with this behind you. Think of the striking a pose in front of the wall of flowers with all your bridesmaids. They are just so pretty and I couldn't not include them because they are just so pretty. 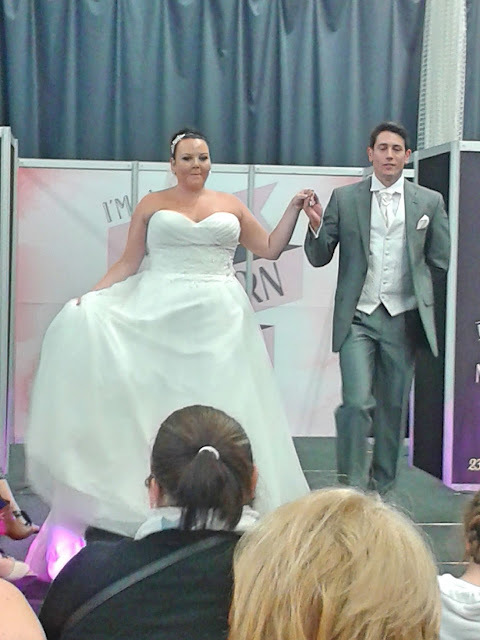 Lastly was the fashion show. 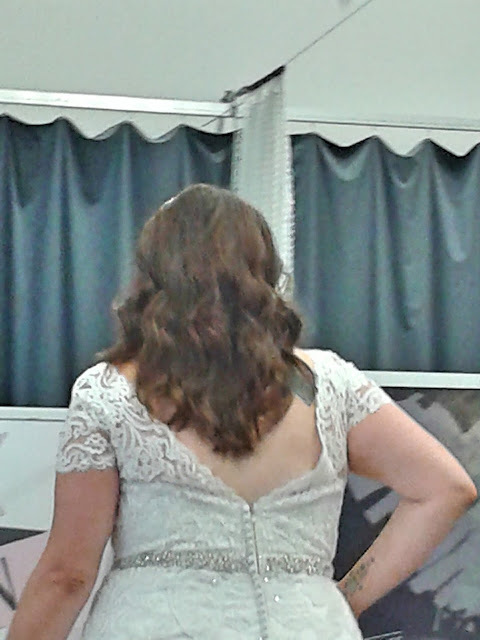 I already have my dress (yes I plan ahead, I'm not getting married for another 2 years but its good to be organised, plus my dress is gorgeous and I love it) but that doesn't stop me from looking. 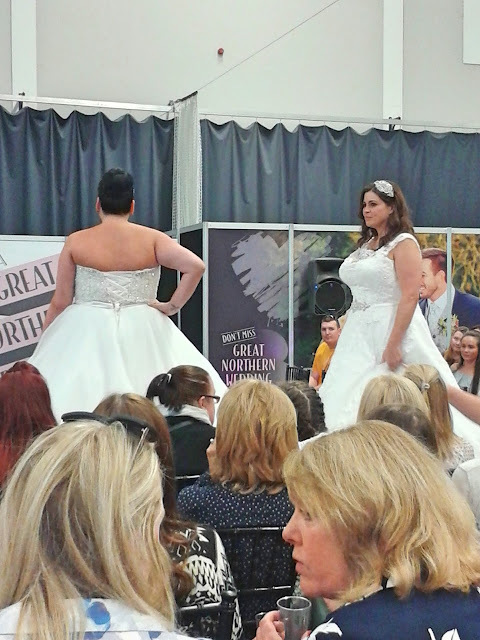 These are a few dresses from Edith & Winston Bridalwear and Bridalwear by Emma Louise modelled by Nicola Lily and unfortunately I wasn't sure of the other models name, but both of you were fabulous. All of these dresses are just gorgeous and my camera has not done them justice. The detailing in them from the beading to the lace is just amazing. The reason I chose theses two models as appose to the rest of the brilliant models is I am plus size and although these girls are a lot taller them me, they still represent what these dresses would look like on my body, which is why I chose to cover just there two companies who do plus size bridal wear. They wont make me look bigger them I am, they are cut so nicely and sit so well on the body that anyone is just going to look gorgeous in them. So well done to both companies and thank you for showing off these dresses. Not forgetting the boys out there, I got a couple of pictures of the grooms and page boy suits. 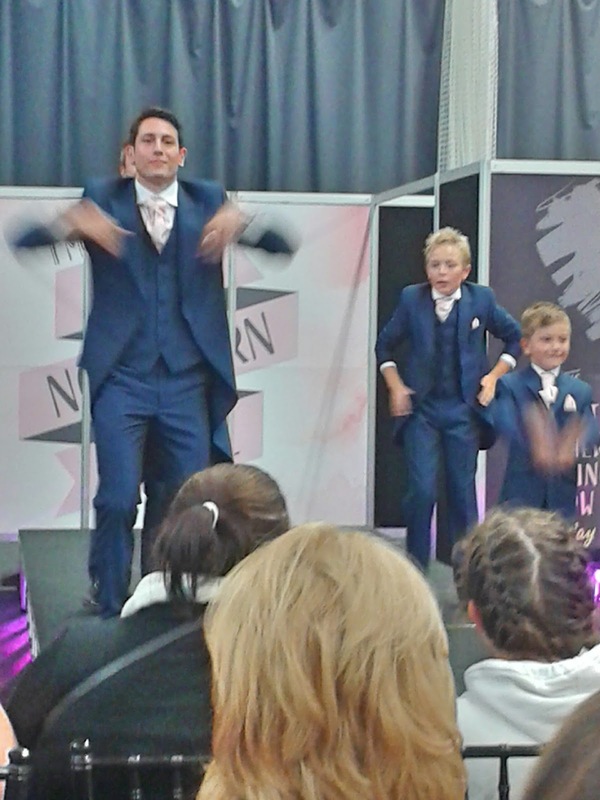 These are action shots because they all did the YMCA on the stage which I couldn't stop laughing at, and the two page boys were adorable. Such little cheeky chaps. 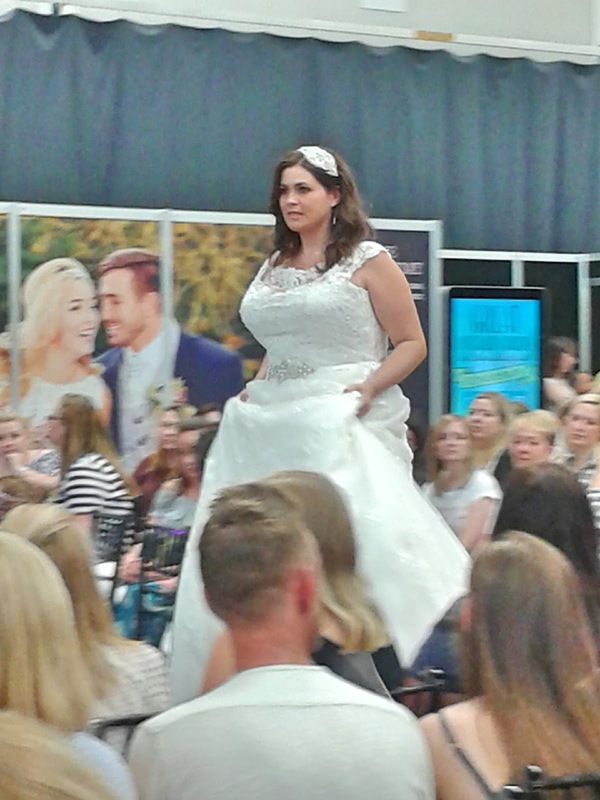 This was my first ever Wedding Show and I loved every minute of it, I have never said my wedding date or written my emails out as much as I did yesterday and at one point talking to a photographer I totally said I was getting married in 2014 apparently, because I had said it so many times I got so mixed up, but I loved it. It was such a fun day out and was so good talking to different people about things I hadn't even thought about. So thank you so much to Little White Book, for organising the event and thank you to all of the companies (and not just the few I have named here) for attending. You made this bride to be feel very special indeed. I hope I have given you all a few things to think about for your own wedding, I know it has for me.